Hungarian Peoples Republic "4th of April" Order of Merit decoration with elaborate ribbon bar. An attractive 43mm gold and enamel decoration celebrating Soviet-Hungarian friendship. The 40mm x 17mm ribbon bar bears an elaborate ribbon bar device that reproduces all of the details of the full sized medal. Instituted in 1984, the order was awarded to citizens involved in promoting good relations between the Soviet Union and the Republic of Hungary. Its title obviously seeks to define that relationship by harking back to the April, 1945 liberation of Hungary from the Nazis (and by conveniently ignoring the 1956 Uprising against the Soviets!) 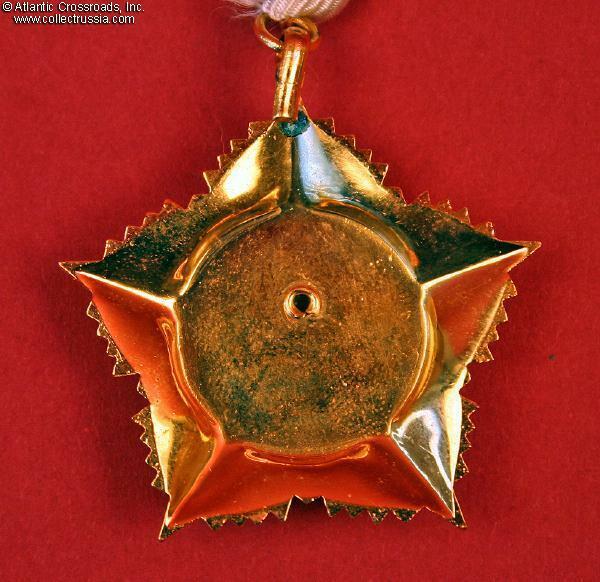 It was considered one of the five highest awards of the Communist Hungary. Although it is difficult to know, this award by its very nature was probably bestowed on both Hungarian and Soviet citizens.